Citizen groups held a protest rally against the construction of a new offshore U.S. air base in Henoko, in front of Camp Schwab at 2:00 p.m. on August 23. 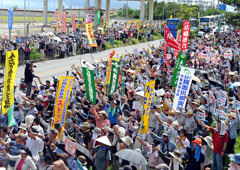 The protest rally was titled, “Let’s go to Henoko to stop new base construction!” About 3,600 people, took part in the rally, the organizer announced. This became the largest gathering after July 1, when demolition of existing buildings within Schwab began towards the relocation for the U.S. Marine Air Station Futenma. Participants raised their voices, “We will never allow the use of force by the government to push ahead with the work, ignoring the will of the people.” They passionately demonstrated to oppose the relocation of U.S. Marine Corps Air Station Futenma within Okinawa. The organizer is also considering holding a citizens’ rally of tens of thousands, calling for other groups to join. They plan to hold rallies like the one August 23 regularly in Henoko. At the rally, Nago Mayor Susumu Inamine, representatives of civil peace groups, opposition lawmakers from Okinawa and members of the Okinawa Prefectural Assembly made speeches. A representative of the “All Okinawa United Forum”, which was set up by citizen groups, political and business people, announced the determination of opposing the base. The participants adopted a resolution to stop a new U.S. air base in order to protect the beautiful sea supporting so much life. They criticized the government for its heavy-handed way of doing things such as mobilizing state power like the coastguard. They determined that they would reject the building of a new air base and not allow the national authorities to reclaim the sea of Henoko. At 9 a.m. on August 23, about 100 people gathered at front of the gate of Schwab. They marched to the Henoko Fishing Port. Shortly after noon, chartered buses, in which protesters were packed, arrived one after another from many regions of Okinawa. Many people could not ride in the chartered buses because they were overloaded, and some people could not get to the site for the rally.